One of the most typical traditions for our village is growing apples. Farmers have always known about the special climate in our village situated between two mountain ranges which makes apples grow well. Elaborate irrigation systems that were set up in the 16th century are still in operation. There have always been markets to trade and sell local products. In 1987, the first market days were held in Haiming. Today, that market is the biggest open market for fruit and homemade products in Tyrol. That’s why Haiming is also called the apple village. Nowadays, the organisation „Oberinntalobst“, mostly called „Obstlager Haiming“, is the biggest wheel for fruit produced in Tyrol. The Obstlager was founded by 10 fruit farmers from Haiming, Silz and Stams in 1991. Today, 25 farmers collaborate to market their produced apples in a modern and efficient way. About 10 million apples are stored in the “Obstlager Haiming” every year, where they get sold to individuals, restaurants or supermarkets. The Obstlager offers optimal conditions with its perfect warehousing, packaging and logistics center with 15 cooling rooms covering an area of 6000 m2. In total, the 25 apple farmers work on about 60 hectares with about 180.000 fruit trees, where many different types of apples grow. Apples are also pressed to apple juice in the newly erected facility. In summer, the farmers try to protect their apples from hail with nets and just this week they had to freeze the blossoms because of the low temperatures. So they hope to prevent big crop failure like they had last year. In June, you can watch a spectacular tradition in our region when the mountains are lit with fires showing different symbols. Every culture has always celebrated solstice, the longest day and shortest night of the year on June 21, with big bonfires. In the twelfth century, the Catholic Church combined the solstice fires with the fires to remember St. John the Baptist on June 24. In Tirol, you can also watch a special kind of fire on the mountains, the Heart of Jesus Fire. It is lit on the second Saturday after Corpus Christi at the beginning of June and goes back to a special vow. In 1796, the French threatened Tyrol and prepared for war. Desperately in need of help and support, the Tyroleans vowed to remain faithfully devoted to the heart of Jesus in order to receive protection and blessings in exchange. The vow worked well, in various battles Tyrolean people could drive off the French and thankfully renewed their vow every year with processions after the Holy Mass in the morning and lighting fires on the mountains in the evenings. In Haiming, members of the Krampus group climb up the mountains every year and light fires in different motives. Even if the weather is not very good, they try for the best. Rafting has become a popular leisure sport in Central Europe since the mid-1980s. In this type of water sport, a river with white water is used for a dinghy. Commercial providers operate rafting as leisure sports. In our village, there are two companies that have provided this kind of sport for more than thirty years. One is FASZINATOUR, the other one is WIGGI, where you can book different trips on the river Inn. A rafting tour usually lasts for three hours and costs between 60 and 80 € depending on the route. Like all nature sports, rafting is in conflict between nature conservation and nature destruction. By rafting, a river landscape is usually not destroyed, since the entrance and exit are mostly fixed and therefore only slightly loaded. Moreover, it is great fun to get wet all over and enjoy the excitement on white water together with a group of friends! Area 47 is the ultimate outdoor playground, the biggest leisure park in Austria at the entrance of the Ötztal valley near Haiming. It is a combination of nature and high-tech with outdoor adventures, water action, an event arena or awesome party locations. The name Area 47 comes from its location at the 47th latitude. The adventure park was opened in 2010 and expanded last year with the new wakeboard area. Now it covers more than 85.000 square metres and has some records to show: the highest diving platform with 27 m, the only deep-water climbing wall, the steepest water slide and the most varied adventure park with 35 different sports you can try out. It cost more than 18 million € to set up all the attractions but it is fantastic, especially for young people. We and many other students from our school go to the Area 47 almost every day in the summer. The longer, the better! This motto is annually celebrated in a thrilling and very impressive way in our county capital Imst on Palm Sunday. The religious background of this custom, which has been practiced for centuries, is the arrival of Jesus in Jerusalem and his being greeted with palm branches. Of course, in our latitudes palm or olive branches were hard to get, so people rather decorated willow branches. The point, however, is the same and can be traced back to the mid-19th century. 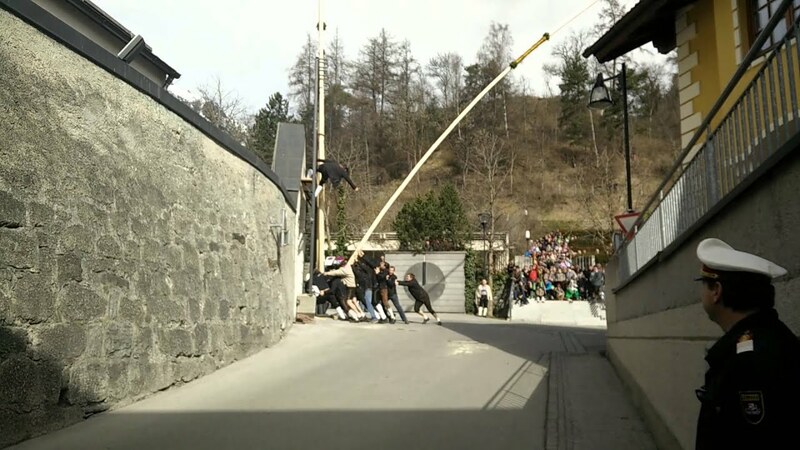 Then, the first competitions for carrying the longest bar started between young men in Imst and is still performed today. The Imster record, and that will probably be a world record, is enormous 36 meters - achieved in 2004. But this is nothing compared to the length of that fabled bar which is said to have measured 100 meters some hundred years ago! The starting point of the procession is the parish church, where all the participants take part in the Holy Mass. Then it moves up the "Bergl", a pathway onto a hill, to the “Pestkapelle”, a chapel in remembrance of victims to the Black Death, and then back again. At all three locations, the slats must be placed - a procedure to which up to fifteen men are necessary. But they are measured only at the end of the procession, which means, the battens must survive the transport and the three-time setting up! Sometimes one of the bars break when it is too long or too thin. The prize for the winners is the same as it has been for centuries: beer and pretzels, and even more important, the honour of being this year’s best team! The custom of Aperschnalzen actually has nothing to do with the "official" beginning of spring on March 21. Weeks before, depending on the region in our country, one hears rhythmic cracking of whips. With the noise people want to drive away winter and welcome spring. The term “Aperschnalzen” derives from the Old High German word “apir” which means “free of snow”. 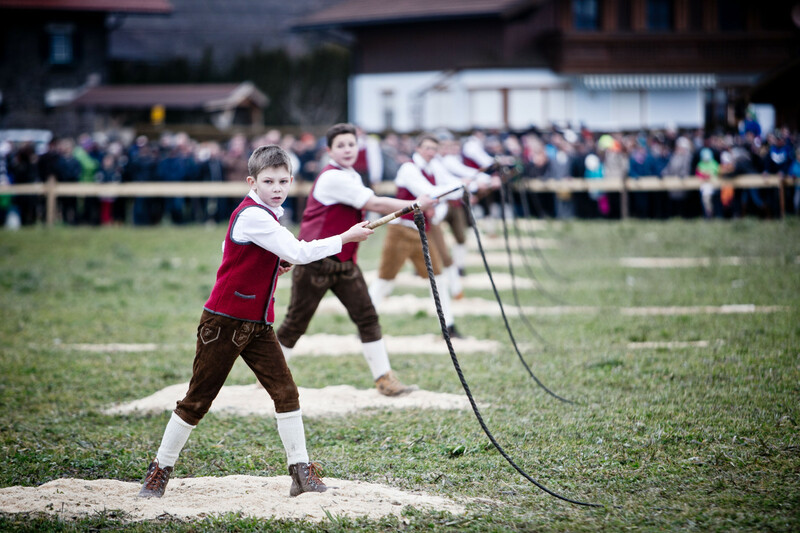 The second part of the word “schnalzen” should resemble the sound of the whip that is used. Mostly young men meet at a certain date and demonstrate loudly their skills they are capable of after many months of practice. For it is not so simple to find the correct rhythm with the whips. In addition to physical strength, a certain flair and skill is required. The whip or flagellum consists of a short stalk (often made ? ?of ash wood) and a three to four meters long braided cord that is embedded with grease. At the end of the line there is a sound generating piece of ribbon made of bast fibre or a nylon cord. With lots of spin the young men – nowadays sometimes also women - swing their whips repeatedly circularly over the head and produce the characteristic bang with a jerky movement in a staccato rhythm. Over the years, this spring custom has also become a sport. The best "Schnalzer" compete in individual competitions, both in individual and group competitions. Some already start around New Year and end on Epiphany, the others consider it a carnival event, and still others wait for Easter time. On "White Saturday " (first Saturday after Easter) one of the most peculiar processions of our country is held in Virgental. At its centre stands a magnificently decorated white ram - which is led around the altar at the final service in the church! The reason for this extraordinary honour is due to a betrothal, which has been made during the devastating plague epidemic 1634-1636. The inhabitants of the communities Virgen and Prägraten are reported to have vowed the establishment of a wayside shrine and the annual sacrifice of a ram to stop the plague. 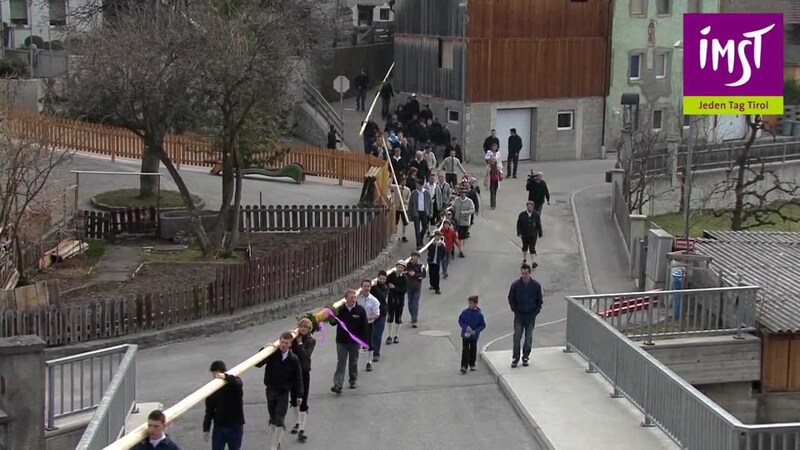 At the time, the procession went from the Virgental to the Lavanter Kirchbichl in Lienz - an incredible walk of some 100 kilometres there and back! On the Kirchbichl the ram was then auctioned off, slaughtered and its meat distributed to the poor people. Since 1920, however, things have changed: The procession starts in Prägraten or Virgen and no longer goes the long way to the Lavanter Kirchbichl, but to the much closer Sanctuary Maria snow in Obermauern (which is one of the most impressive churches in Tyrol with its Gothic wall paintings). 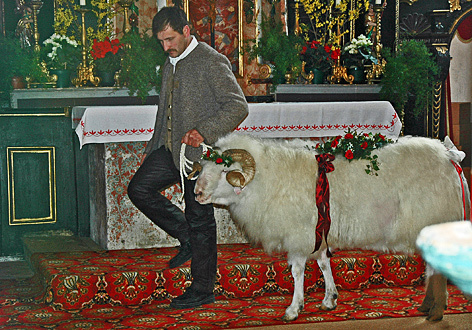 At the end of the procession the decorated ram is still driven into the church and led around the altar. But it is no longer auctioned and slaughtered, but raffled. The proceeds of the raffle are entirely used for the preservation and renovation of the Sanctuary of Maria Schnee. The once widespread custom of disc beating is still in use in some places of the Tyrolean Oberland and Außerfern. It is a peculiar "fire custom" which takes place in the evening of the first Sunday after the end of Carnival. 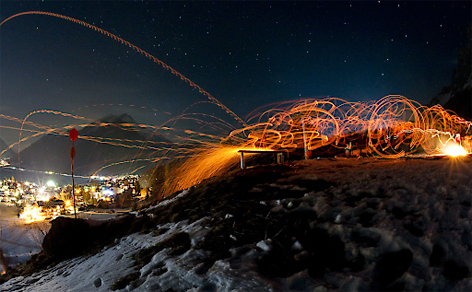 The name “Spark Sunday” which is used in the eastern parts of Tirol, comes from the sparks of the glowing discs that are thrown into the night air. The western regions more often use the name “Cheese Sunday” because of the cheese specialities that are provided for the audience. At nightfall, people meet at the traditional tees, which are usually on hills surrounding the village. 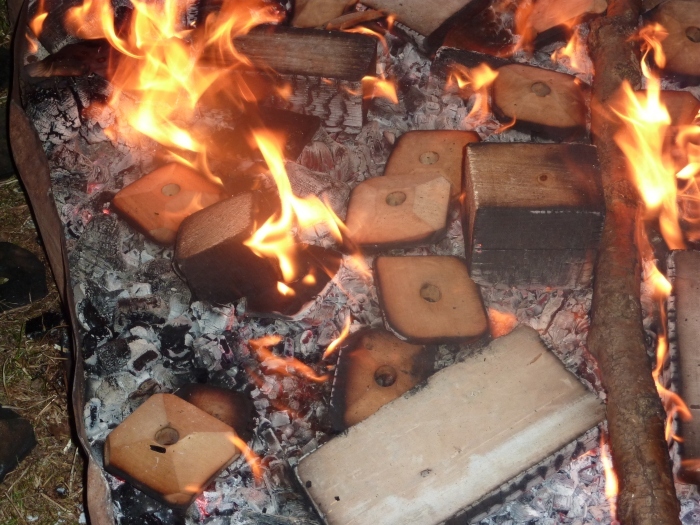 In a blazing fire, five to ten centimetres broad wooden discs are burned to glow. There is a hole in the centre of the discs that enables them to be thrown out with the aid of a long hazel stick. Like sparks or shooting stars they dash through the night. Before teeing an old saying will be said, which is different from one region to another. Often the disc is dedicated to a person, which can be friendly or even made in a bad and scolding way. These discs are accompanied by longer rhymes before teeing that deal with all real or alleged "misdeeds" of the person concerned in the past year. So this has always been a kind of tribunal where public scorn could be poured. When the trees were producing lots of juice in the spring, then many Tyrolean children started to make an interesting musical instrument. The nice thing for them was that they could quite independently handle a knife and thereby were allowed to act almost like an adult. The pipes were crafted from willow wood. Therefore, you cut a piece of branch of about 12 centimetres length with and 2 centimetres width and smooth bark. The highlight and simultaneously most difficult part of tinkering was peeling the bark from the whole piece of wood. 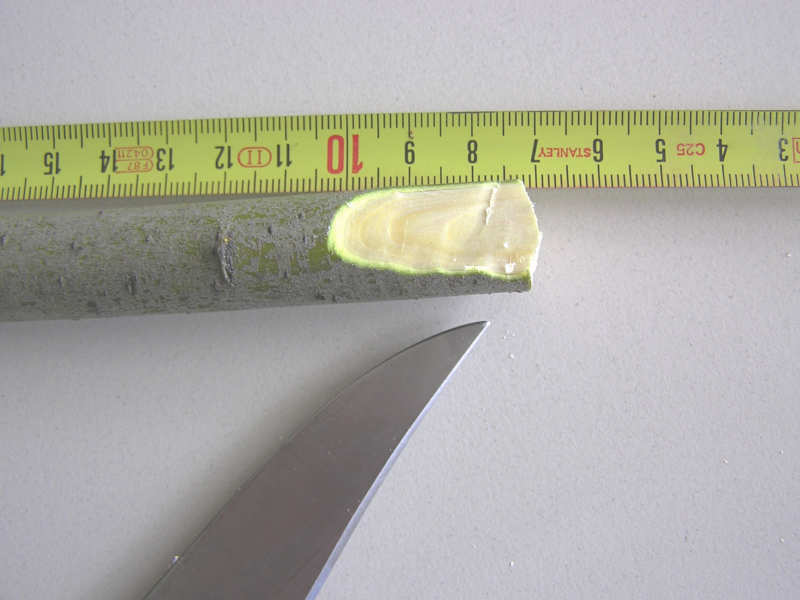 This was done by beating with the flat knife patiently and carefully on the bark with the flat side of the knife’s blade until it could be easily stripped. Then you had to flatten one part of the pipe for blowing into it and cut a hole for the flow of the air. The pictures show how it can be done, but unfortunately, only very few people know how to do it and show it to kids! Inseparable from the Holy Week before Easter are the various forms of ratchets which are used as noisemakers instead of church bells. Ratchets are wooden structures that produce the characteristic "creaking" or rattling with resilient hammers. According to Christian belief, all the bells “fly” to Rome on Holy Thursday and return only after the resurrection celebration on Easter Saturday. With the ratchets the time to go to church is announced and their sound also replaces the ringing in worship. There are lots of different designs and numerous variations of these instruments depending on the region within the country. Most are spun while holding them in hands, but there are also bigger ratchets that are pushed on wheels. The earliest evidence of human settlement in the area of our part of Austria, the Tyrol, dates back to about 10.000 years ago and man has lived here ever since. 4.000 BC agricultural people started farming in this country full of mountains. Even in early history, the Tyrol was a gateway between north and south and a link between two cultural areas - a role that has very much shaped the history of the Tyrol and is still relevant today. The Via Claudia Augusta built by the Romans to connect southern Germany with northern Italy passed through the Tyrol. Today, Tirol is a modern country within a beautiful landscape which has to deal with many problems, especially traffic on its north-south routes. But still, culture is a part of everyday life, in which customs, traditions and social values are kept alive and passed on to future generations. Many of the customs are connected with farming life and Roman Catholic traditions. We have picked some of the customs that are celebrated in autumn and the beginning of winter. Austria is an alpine country with more than 9.000 mountain pastures for about half a million cattle, sheep, goats and horses. In the summer months they are driven up there to feed on the nutritious mountain grass. In Tirol there are more than 2.200 alpine pastures for about 110.000 cattle, 70.000 sheep, 5.500 goats and 2.000 horses. Herders and shepherds look after them and bring them safely back to the valleys and villages in autumn. This is always a big spectacle with beautifully decorated animals and lots of people watching. It is an old tradition to decorate the animals with flowers, bells and belts as thanks and gratitude for a time without accidents high up in the mountains. In some famous tourist destinations in our country, decorated cattle are driven through the villages not only once, but three or more times just for the tourists! A harvest festival is an annual celebration and that occurs around the time of the main harvest of a given region. In our country this festival takes place at the end of September or the beginning of October. People want to show their gratitude and thanks for the bountiful harvest in agriculture and private gardens. The celebrations on this day usually include singing hymns, praying, and decorating churches with baskets of fruit and food, wine or honey. Sometimes there are processions through villages with harvest-crowns made of grain or grape-vine. People not only want to express their gratitude about a successful harvest but also remember that it is not alone due to their own credit that we can enjoy having enough food. 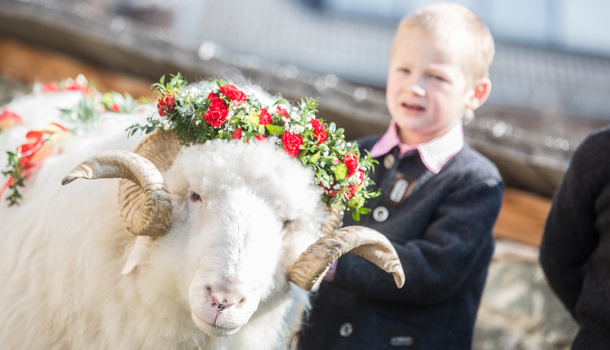 Most of the time the „Landjugend“, young farmers, organize these harvest festivals. But also kindergarten pupils join the festivals with handmade baskets filled with fruit and vegetables. Also private persons bring their home-grown fruit and vegetables to church to be blessed by the priest. Another very interesting custom is the „Krapfenschnappen“ on November 1, All-Saints-Day. 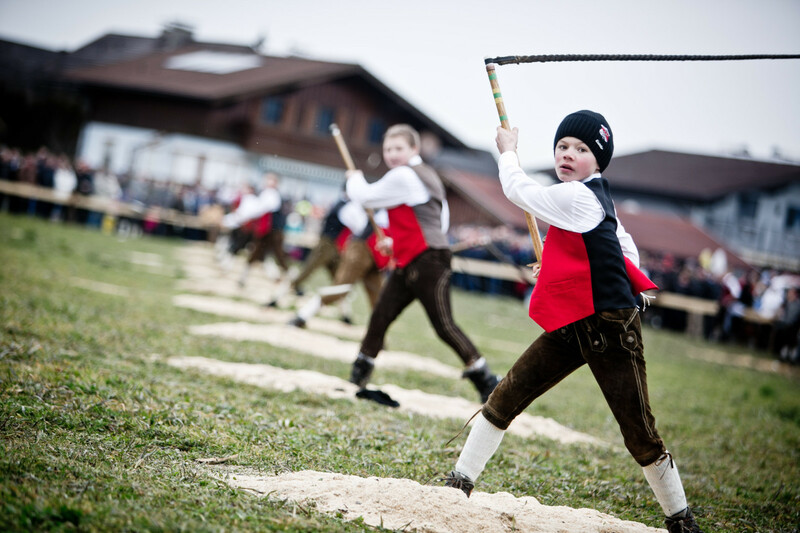 It has been known in the eastern part of Tirol for some hundred years and is still celebrated in many villages. After visiting the family’s graves in the graveyard, boys and young men – nowadays sometimes even girls are allowed – walk from house to house with strange wooden animal heads on long sticks. By pulling a thin rope they make the animals‘ jaws clatter with a loud and strange sound. Some still use very old sticks while others make new ones themselves. They wear white shirts or coats and sometimes also masks made of sheepskin, moss and lichen to cover their faces. They used to get „Krapfen“, a kind of doughnut especially made for that occasion, but today they often get sweets or a little money for visiting the houses which brings luck for the coming year. Saint Leonhard is the patron saint of cattle and horses. His symbols are chains and horseshoes. The celebration takes place on November 6, with a ride on beautifully adorned horses round the church or through the villages and fields. The horses get some specially blessed bread which should keep them healthy throughout the year. As cattle and horses are no longer used as pack and work animals very often, this custom has almost lost its meaning. But in the first half of the 20th century it has been revived by riding clubs and is very popular again. St. Martin's Day or Martinmas is celebrated on November 11, the day when Martin was buried. St. Martin was known as friend of the children and patron of the poor. The nights before and on the night of November 11, children walk in processions carrying lanterns, which they made in school, and sing Martin songs. Sometimes they are accompanied by a rider on a horse representing St. Martin as a soldier who cut his cloak in half to share with a beggar during a snowstorm, to save the beggar from dying from the cold. In some parts of the country big bonfires are burned on this evening. “Martinigansl”, a roasted goose, is the traditional dish honouring St. Martin. The goose became a symbol of St. Martin because of a legend. He was hiding in a goose pen to avoid being ordained bishop, but he was betrayed by the cackling of the geese. In the Alpine regions, the Krampus is a mythical horned figure who accompanies Saint Nicholas. According to tradition, the Krampus gives warning and punishes children who have misbehaved, in contrast with Saint Nicholas, who rewards well-behaved ones with gifts. The word Krampus originates from the Old High German word for claw (Krampen). Traditionally, young men dress up as Krampus at the end of November and in the first week of December, especially on the evening of December 5. They roam the streets frightening people with rusty chains and whips and bells. Although the Krampus appears in many variations, most share some common physical features: He is hairy, usually brown or black, and has the horns of a goat. His costume is made of sheep or goat skin with a wooden mask for the face. Nowadays there are often big Krampus shows with bonfires and a lot of action for the audience. Making an Advent wreath is also a very special tradition in our country. To make the weeks before Christmas a bit brighter and as a symbol of hope, one of the four candles on the wreath is lit each Sunday together with prayers and singing. But nowadays a lot of people just put a wreath up for decoration and don’t believe in the preparation of one’s mind before Christmas. One of the most important symbols of Christmas is the Christmas tree. Many families put up and decorate a fir tree in their homes, nowadays some of them are made of plastic and not real trees. Even in the Middle Ages trees were decorated for special celebrations. Later, people brought trees into their houses and decorated them with nuts, fruit and apples. The first Christmas tree in Vienna dates from 1816, but only rich people could afford buying a tree for Christmas. Martin was stationed in Amiens (France) as a Roman officer. One day, he met a freezing beggar sitting on the road. He quickly cut his coat with the sword and gave the poor man a half. At night Christ appeared to him in the dream, clothed with this half of his mantle and so Martin became the Christian symbol of humility. Later Martin became bishop of Tours and he is still remembered throughout Europe. He is honoured on November 11th with lantern processions and the traditional Martini goose as a festive meal in Austria. Saint Barbara is one of the most popular saints in our country. She had a rich father who didn’t like that his daughter believed in Jesus Christ. So, he had a tower built where Barbara was imprisoned so that she could not meet her friends. He tortured Barbara and was brutal enough to cut her head off with a sword. That second he was hit by a flash of lightning and died. Barbara Day is on December 4th, when people cut a branch of a cherry tree and put it into a vase. If it starts blooming around Christmas, you will have luck in the following year. According to legend, Catherine was the beautiful daughter of the pagan King Costus and his wife Sabinella, who lived in Alexandria, Egypt, around 300. She believed in Jesus Christ against her family’s faith and converted many people to the Christian belief. Catherine was ordered to be burned on a stake. Before that she was tortured in a dungeon without food for twelve days. But angels took care of her wounds and a white pigeon brought her something to eat. Finally, Catherine was beheaded and at the place where her bones were brought to, a cloister was erected on the holy mountain of Sinai. Catherine is honoured in many countries; her day of remembrance is November 25th, which is the last day of festivities and dance before the advent season starts. She is the patron saint of schools and can help you if you have problems with your speech. The day to remember Saint Thomas is December 21st. It is the shortest day and the longest night, when the sun is on her lowest point. Thomas was one of Jesus’ apostles who also went to India as a missionary, where he died in the seventies of the first century. Customs on this special night are not always connected with Saint Thomas, but with the ancient belief in strange things that happened that night. It was the change from one year to the next and so people often asked various oracles about their future. As everywhere in the world, the old year ends with a lot of noise, fireworks, singing and dancing. In Austria, you can hear the most popular Viennese waltz “An der schönen blauen Donau” at midnight and also a special bell rings. It’s the church bell of the Wiener Stephansdom, called “the Pummerin” which rings at exactly midnight to herald the new year. The ringing of the bell and the waltz are broadcast on TV and the radio and lots of people dance in their homes or outside on the streets. Epiphany, also known as Three Kings' Day, commemorates the visit of the Magi to the Christ child. The traditional date for the feast is January 6. In the German-speaking countries, groups of young boys and girls called Sternsinger (star singers) travel from door to door. They are dressed as the three Wise Men, plus the leader carrying a star. One of them writes the year and the letters C, M and B on the front doors. They stand for the Latin words “Christus mansionem benedicat”, Christ blesses this house. The star singers often get sweets and money which is given to some missionary project. The word „Rauhnacht“ probably comes from the German word for incense, “Weihrauch”, which has been used around the time of Christmas and New Year for centuries. On the twelve holy nights between Thomas Night on the 22nd of December until Epiphany, the 6th of January, people went from room to room, out into the stables and fields with prayers, burning herbs and incense to prevent bad luck and evil spirits from their homes. Some families still practise this custom, but often only on 4 nights. During these nights, it was also possible to find out something about your future with various oracles. People believed in superstitions more than today and often lived their lives with the strong belief in some kind of punishment if they did something wrong.